In 1995 Tom took his family cat to his local veterinarian. While there, he picked up a brochure for the National Greyhound Adoption Program, fell in love with the idea of a greyhound and decided he should adopt one. But before bringing home a dog home, Tom thought it wise to fence in his yard. Unfortunately, this expense conflicted with plans the family had to visit Disney World. It was put to a family vote - Disney World or rescued greyhound. The family voted to rescue a greyhound. In June of 1995, Lover, adoption #2696, came to live at the DuBois household where he was renamed Rusty. 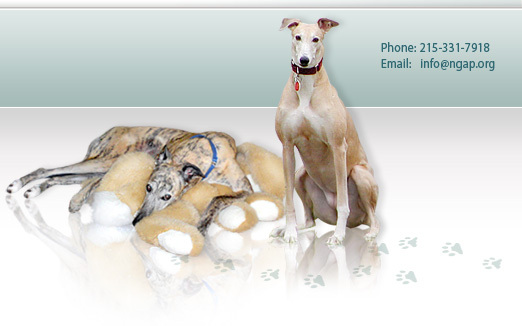 Tom embraced greyhound adoption, not just by adopting, but by becoming a great spokesperson and promoter of the breed. Tom told the sad tale of the racing greyhounds whenever he could. He spoke at churches, schools, etc., taking Rusty with him wherever possible. Tom began attending Meet & Greets with NGAP's South Jersey volunteer group which, at that time, was headed up by Merci Riccardi. 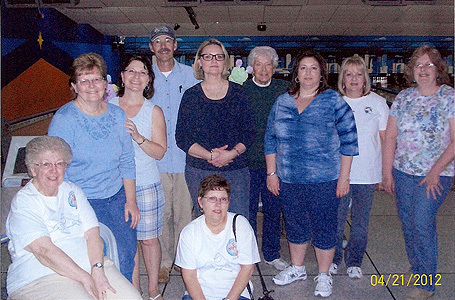 He soon learned there were more and more adopters in his area, so in 2000 Tom started the Cumberland County volunteer group. 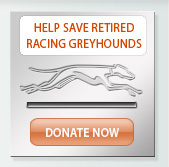 That same year Tom organized the first Greyt Greyhound Bowl, which is still held annually. Tom also spoke at the monthly meeting of Animal Friends and brought along others with their dogs to speak as well. He has held Meet & Greets at Deerfield Harvest Festival for the past twelve years, Batsto Country Living Fair for several years, the Cumberland County Fair for the past ten years as well as events at Elmer Hospital Day, Elmer Harvest Day and Vets in Glasstown. After Rusty crossed the bridge, Patches was adopted from NGAP and, as a certified therapy dog, visits schools, preschools and nursing homes with Tom on a regular basis. 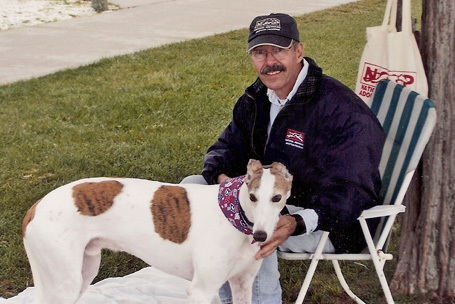 Over the years Tom has also become involved with Grey2K and has taken the time to write to Congressmen, Assemblymen, etc., urging them to vote against the greyhound racing industry. He has lobbied to keep dog racing out of New Jersey. Those in South Jersey who have had the privilege of working with Tom know of his dedication, his kind heart and his easy going way and so it was a pleasure to honor him for all his good deeds related to greyhound adoption at the most recent NGAP South Jersey Holiday Festival Luncheon Fundraiser. 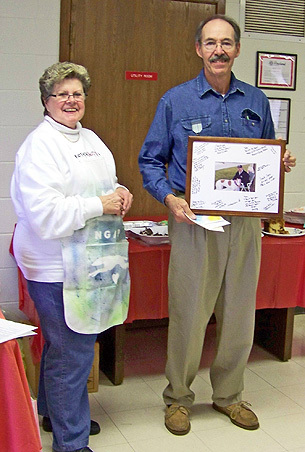 Tom was truly moved when he realized he was the guest of honor at this year's luncheon and was presented with a photo of himself and Patches taken at Critterfest in 2011, along with a gift card to Dunkin' Donuts. Anyone who's participated at one of Tom's Meet & Greets knows how he enjoys his coffee. It goes without question he'll put that gift card to good use. Here in Philadelphia, we may not always see or acknowledge all of the things that Tom does, but he's doing it. Tom never seeks recognition for what he does, he just does it because he loves the breed. 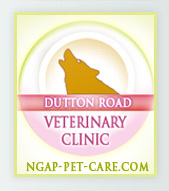 There have been many occasions when NGAP has called upon Tom to help with various things or to pick up a dog in distress, and Tom has always been there for us, happy to help. We are proud to say that Tom is ALWAYS there for us and we truly appreciate him. On behalf of everyone at National Greyhound Adoption Program and on behalf of all of our greyhounds, we wish to thank Tom for all of his hard work. True to form, Tom has indicated that he was humbled by the presentation and would like to extend his gratitude and say 'thank you' to everyone who took part in honoring him on November 25th, 2012 and we know he means it from the bottom of his heart.